Time for an AC Tuneup! 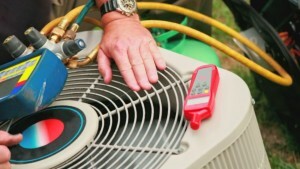 It’s that time of year when you should have your air conditioning system checked and tuned up for the upcoming season. A tune-up, also called preventative maintenance, should be performed annually on your AC system, making it operate more efficiently. It’s also a safety check which will detect any defective or damaged parts. An annual tune-up is recommended to keep your system running smoothly and efficiently. Call Campbell Heating & Air Conditioning today to schedule your checkup!